April 5th recognizes a food holiday that pizza lovers all across the country will enjoy. It is National Deep Dish Pizza Day. In ancient Greece, the Greeks covered their bread with oils, herbs and cheese which some people believe is the beginning of the pizza. In Byzantine Greek, the word was spelled “πίτα,” pita, meaning pie. A sheet of dough topped with cheese and honey, then flavored with bay leaves was developed by the Romans. The modern pizza had its beginning in Italy as the Neapolitan flatbread. The original pizza used only mozzarella cheese, mainly the highest quality buffalo mozzarella variant which was produced in the area surrounding Naples. It was estimated that the annual production of pizza cheese in the United States in 1997 was 2 billion pounds. The first United States pizza establishment opened in 1905 in New York’s Little Italy. 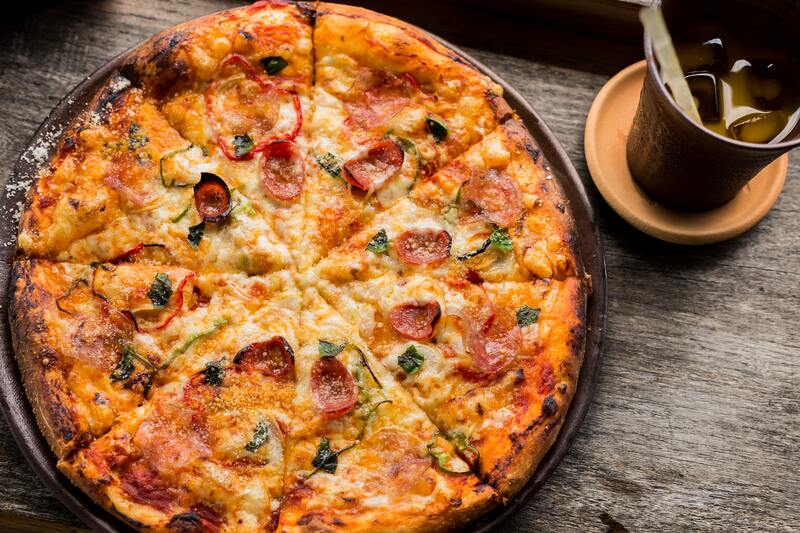 Pizza has become one of America’s favorite meals. Hard to imagine a month going by without ordering a pizza or two around our house. Whether your favorite pie is pineapple and ham, or pepperoni, or all meat supreme, or a vegan variety, or just plain old cheese, there is something most people like about a slice of hot greasy pizza. No matter which way you slice it, pizza has a long history. Biting into the deliciousness of and savoring the Italian seasoning that adorns the succulent pieces of sausage or Canadian bacon or …. actually, I better stop before you start drooling all over your computer. I prefer you finish reading my post BEFORE calling your favorite pizza joint and ordering your next lunch or dinner. An old joke goes: I went to the pizza restaurant and asked how many slices came in an extra-large pie. The waitress told me 12, so I responded. Can you just have them cut it into 6 pieces because I don’t think I can eat 12 pieces! Ok, that was probably a bad Dad joke, but my kids like me telling them every time we order out again. There are good pizzas, there are not-so-good pizzas, and there are really great pizzas that you want to tell everybody in the world about. Some restaurants are skimpy on the toppings while others have so many that you almost need a crane to carry the thing out to your car because it weighs so much. Realtors are like pizza. Some are good, some are not-so-good, and then, there are some really great pizzas, oops, I mean realtors, like me. I strive to be the kind of realtor who gives you more than you asked for or even more than you expected. All the extra toppings come with my service like staying on top of the paperwork, calling you back when I promise to do so, following through on both sides of the transaction, and many other things that help make your pizza selection, oops, I mean realtor selection, a vitally important part of buying or selling a new home. So call me today and I will help ensure that your next pizza…um, I mean home, is delivered hot, fresh, and ready to go when you get to the closing table.